31 January 2017. Engineers at North Carolina State University in Raleigh developed a hydration sensor worn on the skin and built into two low-cost prototype wearable systems. A team led led by electrical engineering professor John Muth and mechanical engineering professor Yong Zhu describes the device in the 27 January issue of the journal Advanced Healthcare Materials (paid subscription required). In this project, the team seeks to build a miniature and much less expensive hydration sensor that’s still easy to deploy, and can operate in real time. The researchers designed the sensor as a capacitor, a circuit with two electrodes that stores energy, but unlike a battery does not produce its own power. The sensor is built on a matrix of polydimethylsiloxane, or PDMS, a common, widely used biocompatible polymer found in a number of products and used more recently in fabricating biomedical micro-electromechanical systems. The sensor’s circuitry uses silver nanoscale wires. When printed into a thin PDMS film, the sensor device is elastic and can conform to the shape of the skin where it’s placed. Electrodes in the sensor monitor electrical characteristics of the skin that correlate directly to a person’s hydration, and generate signals for readings on connected systems and devices. The authors report the sensor records an individual’s hydration as accurately as larger and more expensive hydration monitors now on the market. And based on lab tests with a number of artificial skin surfaces with a range of hydration, the sensor provides accurate readings despite varying levels of humidity in the surrounding environment. 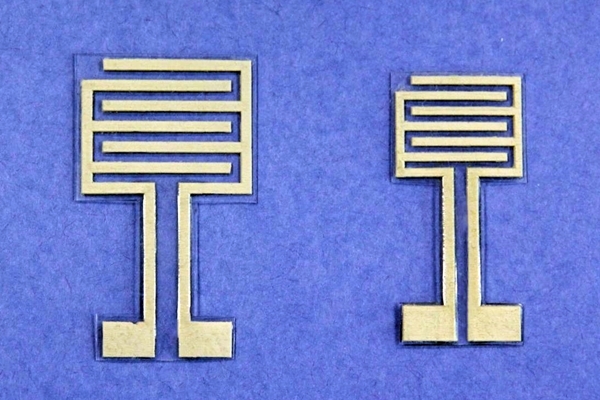 The researchers configured the sensor into two prototype applications. The first device is a skin patch worn on the chest that includes three electrocardiogram electrodes and a strain sensor, along with the hydration sensor. This device is designed to monitor a number of health factors, including hydration. The second device builds the sensor into a wrist band with a network analyzer chip, button cell battery, low-power microprocessor, and Bluetooth connectivity. Both prototypes can transmit their data to nearby mobile device or laptop.